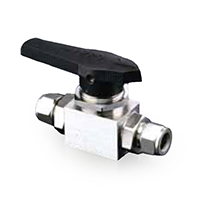 The DK-Lok VCH86 Alternative Fuel Ball Valve is specifically designed for the CNG/NGV market. Wetted components are compatible with compressed natural gas (CNG), liquid petroleum gas, gaseous and liquid hydrogen. It incorporates a very sturdy body with end connections manufactured from stainless 316 bar stock. This valve carries many industry certificates for meeting industry requirements, and can also be pneumatically actuated for remote actuation applications.